On many occasions, a dissuasive measure like the sound of an alarm is enough to avoid that a thief takes with him something important. That is the general idea behind Laptop Alarm. 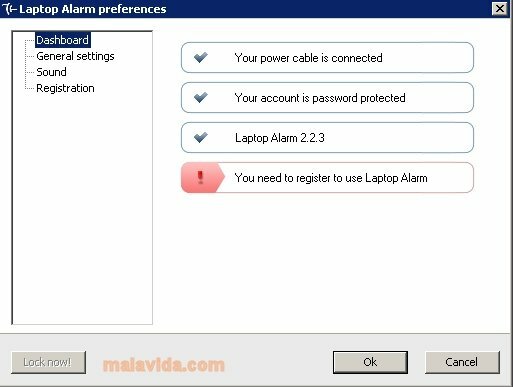 Laptop Alarm is an invisible protection for your laptop computer that by means of a sound alarm focuses peoples attention towards anyone that tries to rob your computer. To do so, it detects certain changes like the removal of the power cable to activate a bothering sound to give away the thief. Don't worry about having your laptop stolen while working with it at the library or at any other place. The protection can also be activated to avoid that anyone disconnects your computer's peripherals, like the mouse or USB pendrive. 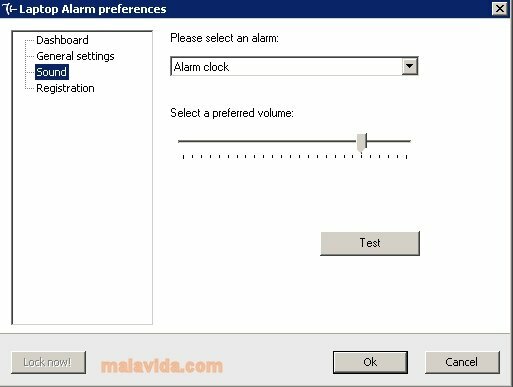 From the Laptop Alarm configuration options, you can select the type of alarm (watch, car,... ) and the sound's volume. Furthermore, it's advisable to activate the update system to enjoy the latest additions to the application.